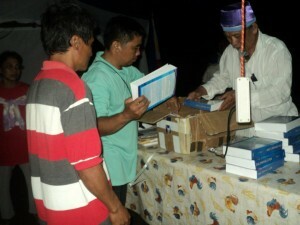 Photos from Qehilat Chasidie Umot Ha-Olam, Inc.
One of the QCUHO (formerly QCHU) Noahide synagogues in the Philippines. 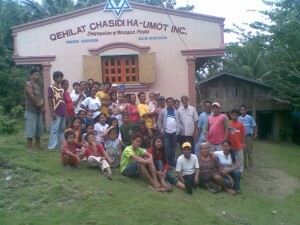 Qehilat Chasidie Umot Ha-Olam (“Congregation of the Pious of the Nations of the World”) has a population of over 1000 adult members, with almost 20 Noahide synagogues in various locations in the Philippines. All embrace the Oneness and Unity of the One True G-d, following the 7 Noahide Commandments and accepting the Torah of Moses. Every year, local and general Assembly Meetings are held, during which time there is a focus on studying the faith and the practical details of the Noahide Code from the United Noahide Academies® courses provided from Ask Noah International (asknoah.org), as well as studies of portions from the Torah. 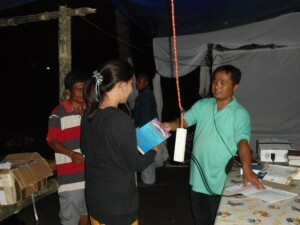 The QCUHO group is registered with the Philippine government, so their officials are authorized to (for example): legally officiate at marriage ceremonies, issue legal certificates of membership, conduct youth seminars, and provide livelihood programs for women and youth. QCUHO chapters meet regularly on Saturdays for community services at their local synagogues, using a service of prayers and readings for Noahides that was developed jointly with Ask Noah International.